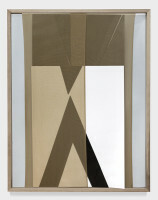 Higher Pictures, New York presents an exhibition of works by artist Sheree Hovsepian (b. 1974) that started on March 11 and will run through April 22, 2017. The show features the artist’s new series of assemblages through which she continues combining photographic works with different studio art disciplines. The consistent reference to this exhibit is darkroom photography and includes elements of painting, macrame, lost-wax casting and woodworking. Asserting materiality of the photographic medium, Hovsepian looks at the physicality of the process of making the photograph a malleable medium, both concept wise and as raw material.